We are in the season of hikes. The petroleum companies have hiked their prices and are still sulking that their bottom-line is in the red. The Railways raised passenger fares through an executive fiat one month before the budget. Taking cue, the electricity companies and the bus companies hiked their rates. Like the petroleum companies, they are sulking that they are still not able to recover their operational costs. 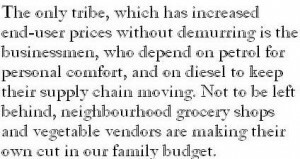 The only tribe, which has increased end-user prices without demurring is the businessmen, who depend on petrol for personal comfort, and on diesel to keep their supply chain moving. 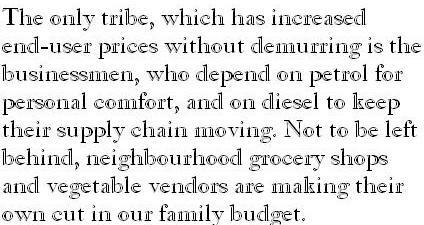 Not to be left behind, neighbourhood grocery shops and vegetable vendors are making their own cut in our family budget. The situation brings to mind the drive for voluntary contributions whenever the nation is gripped by patriotism in response to booming guns on the border or whenever some part of the nation is devastated at the hands of the nature. From a policeman to the school teacher, everyone gets into targeted collection mode. The police man turns to the ‘lalaji’ on his beat. And the teacher to the students in the class. Neither coerces, as you and I know from experience. The ‘lalaji’ has already made his voluntary donation to the local traders association, which is drum beating its nationalist credentials, to the local municipality’s tax collector, weights inspector, and sanitary inspector, who have been asked by their sectional heads to do their bit in the service of our mother land. The trader has also answered the pleas of his daughter in the primary classes and of his son in the upper primary classes. For both kids, it is a matter of family prestige; they donot want their father to be bracketed along with the Merchants of Venice. Ditto for his brother in the college which has lined up a cultural extravaganza featuring film stars and the like. And for his wife too, who wants to hold her head high at the kitty party and amongst the Merchant Wives Association. To demonstrate that everyone in the family is a worthy citizen, voluntary donations are offered, often after some song-drama with frayed tempers and sobbing hearts. Still, the earning member of the family, who is the only one poor ‘oversoul’ – contrary to the images of multiple incomes in every middle class home because of mushrooming BPOs, loves to indulge in just one luxury – seeing his name in print. The only way he can do is to send a cheque or money order to his favourite newspaper, which has set up a Relief Fund with great fanfare. What is so common between the drive by multiple agencies for voluntary donations and the hikes of administered prices announced by various government agencies? Well both pinch your pocket and my pocket. We, the people of India, that is Bharat, pay for patriotism, and for our thirst for happiness. The ‘Lalaji’ has no problem because he pays through one hand and collects it through another hand. The ‘Neta’ has no problem because he doesn’t pay generally and when he does pay occasionally someone else foots the bill from behind. Yes, if the consumer happens to be a government employee, a hike in dearness allowance is assured. The working class in the organised sector too gets some compensation because their wages are linked to the price index. Is this a consolation for both? No, certainly not. There is a time lag between the price hike and DA hike. The price index doesn’t reflect the market till the government agencies entrusted with the task of compiling price data do their job to perfection. More over the Yojana Bhavan is resolved to talk down the price index. And the Finance Ministry is determined to ushering in the Feel Good Factor, (FGF). Well, you cannot blame them. Also their pathetic inability to learn from experience that the instruments at their command are no match to the task given to them. Their mandate is to keep refurbishing the image of the leadership of Shining India as caring for the aam aadmi. Text book economics pushes them to regulate money supply to address the problem of shortages created by supply- side constraints. Like administering Anacin to a person with stomach-ache! Back to basics, goes the war cry; the media becomes the devil’s advocate with deep background briefings giving a veneer of respectability to each by-lined despatch. And every economic ministry and every enterprise in the government are allowed to become islands and have their cake without much ado as our experience since beginning of the New Year bears out. In the adrenaline rush to check deficits – revenue and fiscal, the bureaucrats on Raisina Hill and in the Rail Bhavan, and the superannuated bureaucrats masquerading as the regulators of electricity to insurance and share market, have reduced governance to a chartered accountant’s delight. This entry was posted in News and tagged Business Practices, Elections, India, Narendra Modi, Price line, Prime Ministerial ambitions, Rahul Gandhi. Bookmark the permalink.